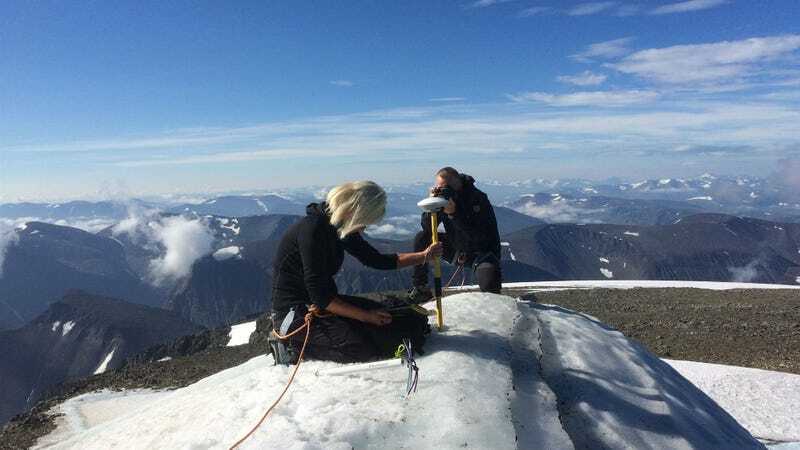 Researcher Gunhild Ninis Rosqvist measures the height of the south peak at Kebnekaise. Mountain climbing is another one of those weird, unexpected climate change casualties. After weeks of intense heat that’s set Scandinavian forests ablaze, new research shows that the heat has also shrunk Sweden’s tallest peak. If the heat keeps up, the mountain may very well lose its title. The massif of Kebnekaise sits on the northwest edge of Sweden. It has two peaks, the southern of which is the taller one, and thus the highest spot in Sweden. It owes its extra lift to glaciers that cap it, whereas the northern peak is craggy rock. But after a month of blistering heat, which saw temperatures climb into the 90s above the Arctic Circle, a lot of the snow and ice on the peak has melted. Researchers at Stockholm University measured the decline using GPS units that are accurate to within 2 centimeters (0.8 inches). A month ago, the southern peak measured 2,101 meters (6,893 feet) above sea level, but the end of the July, it stood at 2,097 meters (6,880 feet). It was only six inches higher than the northern peak at the end of July, but the forecast means that it’s probably no longer taller. Gunhild Ninis Rosqvist, a geographer at Stockholm University, said in a statement that the north peak likely now holds the crown of tallest mountain in Sweden. “I’ve never seen this much melted snow on the southern peak as I did this summer,” she said. “This is happening very fast. The result of this hot summer will be a record loss in snow and ice in the mountains,” she told Sweden’s The Local. The heat wave that has engulfed Scandinavia was made twice as likely due to climate change, according to an analysis published last week. That it’s so rapidly altered the geographic record in Sweden speaks to how intense the heat has been, but the steady uptick in temperatures has been taking its toll on ice for more than a century. With few exceptions, glaciers have been shrinking all over the world. Melting ice in Antarctica and Greenland is also causing the planet itself to warp. On the opposite end of the spectrum, California’s drought (which has also been linked in part to climate change) caused mountains to grow an inch, underscoring how much humans are a force of geology. And in Sweden this summer, people have been able to watch that force at work with their own eyes.